Born in England in 1793, James H. Gillespie was a portrait painter of some renown. In his mid 30's he moved to Canada where he settled in Nova Scotia and then later, in the manner of itinerant artists of the day, traveled and worked down the East Coast of the United States. He painted his portraits in a number of identifiable styles, but one thing they all had in common was the painterly quality he was known for, reflecting the personal features of each sitter. 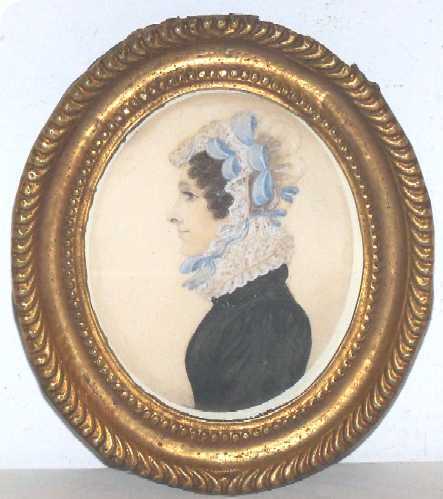 This particular portrait done in watercolor, ink and pencil is classic Gillespie, of the type with no background shading. While many of the portraits still retain the original label or fragment thereof, in many cases the backs were removed and opened to be cleaned and thus the labels were lost to future generations. His style is so identifiable that is possible to make a correct attribution to him. Carefully modeled features and meticulously rendered attention to detail in the clothing make this a very desirable addition to a collection of Portrait Miniatures.